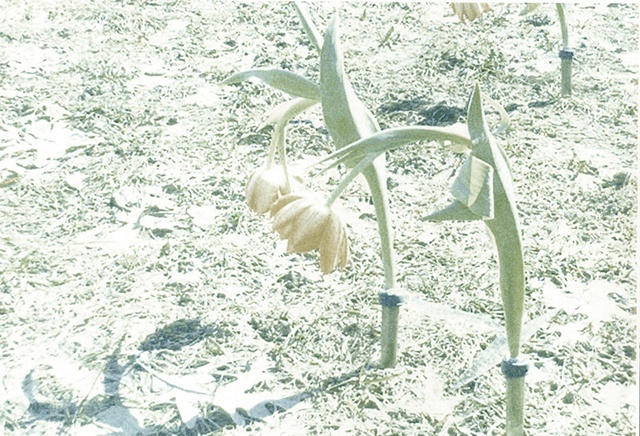 Hampshire College commissioned the piece "False Spring" after a particularly long winter. The college had been blanketed in snow for 4 months and the piece was timed for the first thaw. 900 tulips were overnighted from Holland and placed in small plastic vials and inserted into the ground on a 30x30 grid on a 1 acre piece of land in front of the library, with signage to pick, and attached selections and reinterpretations from the Oxford English Dictionary definition of Spring. After sundown any remaining tulips were collected and redistributed to the community as a gift from the school.